Optimal tree care starts with proper pruning. We offer Denver tree trimming and tree removal, and we are fully equipped to handle any size tree or landscape. With more than 12 Certified Arborists who are trained and experienced to trim or prune your trees and shrubs, we know how to do the job correctly and safely. Denver Tree Removal – We have a crane for large trees! Corrective pruning of young trees: Eliminates weak and poorly attached branches and helps establish a stronger, healthier branch structure that will require less maintenance while reducing potential storm damage in the future. Improve health: Deadwood is the prime breeding ground for insects, diseases and decay. Removing deadwood is an important pruning objective. Allowing for more air and light can also reduce some disease issues and allow for healthier growth. Reduce hazards: Many large trees can become hazardous. These hazards can include dead, cracked and poorly attached branches that have not been addressed earlier. Our trained Arborists can evaluate and reduce these risks with proper pruning. Improve appearance: Everyone likes a healthy, well-shaped tree. Crown cleaning, along with lightening of excessively long branches, can return a tree to its natural beauty. Clearance and raising: Often trees have not been planted in ideal locations. They may be too close to buildings, wires or other trees. Sometimes they are too low to walk or drive under. These are just some of the areas we include in our pruning specifications. Shrub pruning: Shrubs can benefit from a variety of pruning techniques that include natural and rejuvenation, as well as formal shaping or shearing. Pruning can also help to contain size. There’s an old tree surgeon saying that goes: “The best time to prune a tree is when your saw is sharp.” And indeed, many tree and shrubs can be pruned any time during the year. Some trees however, especially disease-prone species like Crabapple, Apple, Hawthorne, Pear and American Elm, are often best pruned while they are dormant. Some flowering shrubs, such as Lilac and Snowball, are best pruned shortly after flowering so that new buds are allowed to form. Winter or dormant pruning has other advantages too. For one, tree structure and other defects are easier to see. Branches without leaves are lighter and easier to clean up, and flower beds and other garden plants under the trees are also less likely to be a concern. The FOX31 video above shows what a day in the life of our Arborists and tree climbers is like. Watch how Mountain High Tree’s experts climb, prune, remove large branches with cranes, and battle squirrels! 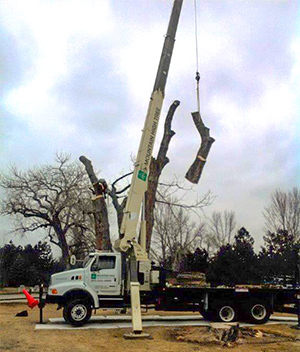 We have all the equipment to handle trees of all sizes. Poorly made cuts, excessive thinning of live branches, topping and other bad practices can predispose trees to many short- and long-term issues. Every cut made in a tree should have a clear purpose. Not understanding these basics can lead to a bad result.